The RIDGID 18-Volt X4 Cordless Jigsaw Console is fully compatible with all RIDGID 18-Volt slide battery packs. The jigsaw features a tool-free blade change design and variable-speed switch to help match the appropriate speed to each unique application. Multiple orbital selections for wood cutting ensure an exact cut every time and the Hex Grip technology provides superior ergonomics for extended use. Includes R8831 Jig Saw, Wood Cutting Blade, Chip Shield, Anti-Splinter Insert, No Mar-Base Plate, T-Shank Wood Cutting Blade and Operator's Manual. 18V Orbital Jig Saw is rated 4.5 out of 5 by 16. Rated 4 out of 5 by boduke from Very nice tool but REALLY needs an led light Love this jigsaw and all my other Ridgid Cordless products. Pretty much all have always exceeded my high expectations. The jigsaw has a nice feel to it--weight, ergonomics, operation. I have no complaints other than it just really REALLY should have an LED light on it. Rated 5 out of 5 by naw1949 from As Good As It Gets, top marks here. This portable is as good as the corded version or better. It shows a lot of design effort; hefts a really good weight; does not break every darn blade and cutting and visibility is the best. Blade changing a snap; and you can really direct and perfect a cut in any position and material. Rated 4 out of 5 by Pyleal8 from Solid jigsaw This jigsaw is great, a bit heavy, but the last jigsaw I will ever have to buy, since it has Ridgid's lifetime warranty. Speed is controlled by the pressure placed on the trigger and it stops instantly when trigger is released. Other than it being a bit heavy the only other downside I have with this jigsaw is the safety trigger which most power tools companies are putting on tools nowadays.. Rated 5 out of 5 by dcornell55 from I like the angled handle I found it easy to handle with plenty of power. The power seemed to last an extremely long time for my project. I also like the angled handle, it made lowering my arm more comfortable while scrolling. This has become my go to tool for all of my scrolling projects. I do a lot wood working with my grandson (5 years old) even though it is a little heavy for him he still wants to use it all the time, he thinks its fun. Why no LED blade light? Any plans to add an LED light to the next incarnation of this tool? Just about every tool on the market now has a guide LED, so I was surprised to see this one does not. I was looking to purchase the 18V Ridgid tools and was intrigued by the jigsaw availability, as I use one very often, but I may look elsewhere for this reason alone. Any plans to release an X5 brushless version? 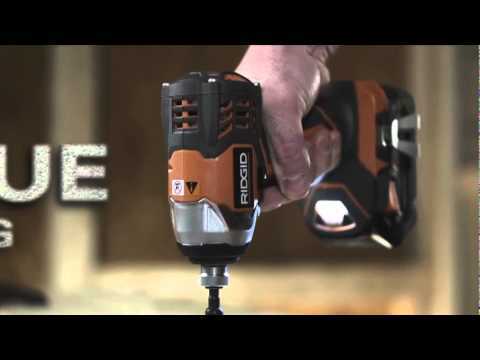 Most of 18v cordless tools have had an updated X5 brushless version. Will Ridgid be releasing a newer version soon? An updated cordless jigsaw is on our radar and should be rolling out sometime in 2018.